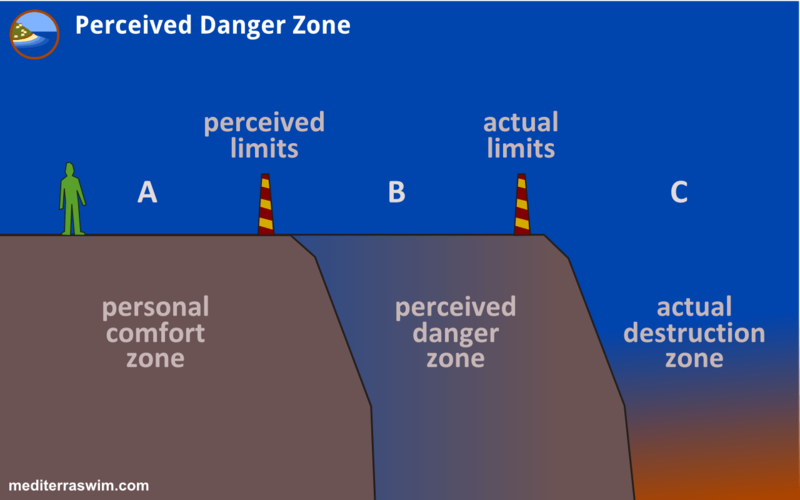 Perceived Danger Zone | Mediterra - Swim & Run Better Than Ever! This is a diagram I made to supplement my thoughts in the previous essay on Overcoming Swimming Fears. I just want to outline the subject in this post, while I can see the opportunity to expand a lot on each section of this diagram. This is where I currently feel comfortable to roam and exert my effort and challenge myself. My brain knows I don’t know what is beyond that barrier and therefore I believe am not likely equipped to handle it and survive. So, my brain sets up protective fears to prevent me from going there. This is as far as I think I can go without feeling like I am endangering myself. There are other people functioning in this zone but I don’t know how they do it. But, I too might be able to go there if I had training to understand how it works, and skills to negotiate that area like others do. Something must spark my curiosity and hope that it is possible for me too. This is where even well-trained people know it is time to back off for safety sake. Of course, some people still dare to go beyond. Some of those survive and thrive to prove to us that the cliff is still a bit further off than we thought, while others die to prove that the barrier was there for a good reason. Want to be challenged to do more than you think you can? Check out this Dutch guy Wim Hof , his achievements, and his program InnerFire. I read his pdf ebook Becoming The Iceman. It definitely has me intrigued. I thought up this diagram to help explain the fear we feel about stepping into a new, potentially dangerous area of achievement – like swimming in cold water, or swimming what seems like an incredibly long distance. The risk is relative to the level of understanding and skill the person has who enters that area. It is not impossible. Making impossible, possible is what training is for. So much more capability and freedom is available to us, which normally-equipped people are accessing every day in extra-ordinary ways. Will you seek out some training and step beyond your barriers too?